Who said adults can't write on walls? Create any size, any shape, any colour whiteboard! Contact us for more information on how IdeaPaint can help you. 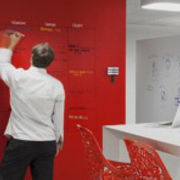 Add IdeaPaint in meeting rooms, Individual offices, Common spaces, Labs, Cafés, Hallways. Turn empty wall spaces into a hub of creativity, collaboration, and idea generation. Use for scheduling, project tracking, brainstorming and imporptu "hallway" collaboration. Create a family interaction wall with shared calendars, reminders, chores and messages. Turn a child's room into a place to explore and express their creativity and imagination, and manage their responsibilities. Create a 360-degree learning environment (paint walls, desks, chairs, floors, lockers, etc. ). 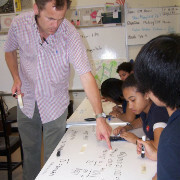 Re-coat chalkboards and worn-out whiteboards at a significant cost savings. Copyright © 2014 Creative Monsters. All rights reserved and other such important stuff. Transform the way people work and learn by turning virtually any surface into an erasable canvas to collaborate, communicate, and fully explore Ideas. Why do you need IdeaPaint? IdeaPaint is installed in some of the world's most innovative companies: Apple, Google, NASA, Amazon, Limited Brands, Nike, Rebook, AutoDesk, Quicken Loans, Yelp, Adobe, Evernote, SCVNGR, MassChallenge. "IdeaPaint is used in so many ways, people are behaving differently, interacting differently, and really working together in a more spontaneous way." The more "whiteboard space" you have the more you can brainstorm, and the more you can collaborate. Ultimtely, a more productive environment! What are the benefits of IdeaPaint? 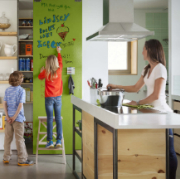 IdeaPaint is an innovative environmentally responsible whiteboard paint that transforms virtually any surface into a high-performance, dry erase canvas. Your Ideas deserve more - more room to grow, more space to develop, more freedom to flourish. The best part - you do not need to change the colour of your walls or surfaces.